The American medical system compared to the medical systems of the rest of the world. David Berg's views of the Medical system in the U.S.A.
Why did we (members of the early Children of God, now the Family International) start having babies at home and where were we?--We were in the U.S. where it costs a helluva lot and they don't let you be led by your convictions, and you're surrounded by ungodly people and a satanic atmosphere! In the U.S. they can take your baby away from you at any little provocation. If you run into a hospital to have a baby at the last minute, they could call you an "unfit mother" and have your baby taken away by the courts! But it is not so in most of the rest of the World. Most other countries are poor and have midwives, and they'll let you have your baby at home if you want to, as long as you have a midwife in attendance or somebody who knows a little about it, so in case you have a serious problem they can take you to the hospital--and it doesn't cost you a fortune! In the United States it is almost a shame to have children at all, much less at home!--But in most other countries of the World, children are still considered a blessing and they like to have children. They still consider them a blessing of God and enjoy them. The U.S. is a dictatorship, especially its medical system, and they don't give you any choice once you put yourself in their hands. You have to do what they tell you to do, and if you don't, they can have you behind bars!--It's the law! In the hospitals in these other countries they give you your choice: If you don't want to be cut, they don't cut you. But in the U.S., if you don't comply with everything they do, then you have to sign a release taking responsibility for your life in your own hands.--And if they can, they'll railroad it through, choice or no choice! 8. It's a whole different kettle of fish compared with the poor nations of the world, where you can have a baby at home and have it naturally any way you want, and where even if you call a midwife or go to the doctor or hospital it doesn't cost you a fortune--and they let your family come right along with you! There are several reasons why i would rather not go to one of their U.S. hospitals! Number one: The way they handle any kind of cases--illnesses, births, whatever--is totally dictatorial and you have almost no choice whatsoever. You are compelled by law to do whatever they say. There are very few times when you have any choice whatsoever. 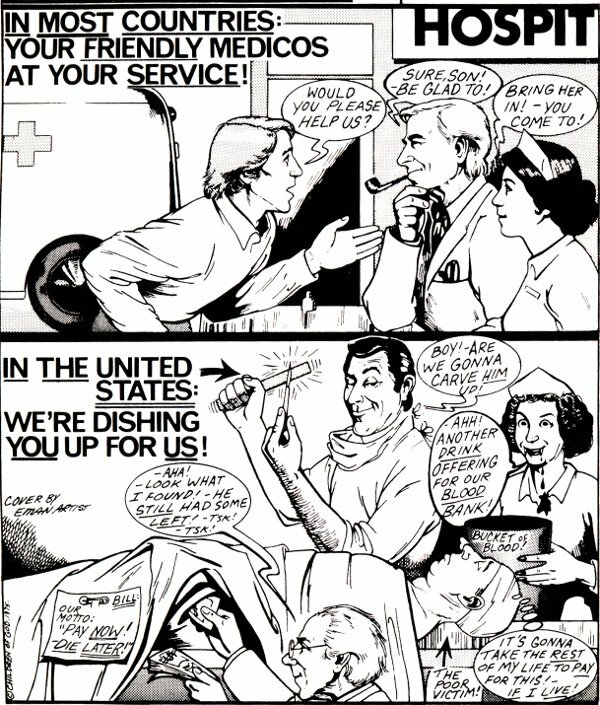 Number two: The whole U.S. medical system is as anti-Christ as can be! Number three: It's as expensive as can be and costs you a fortune, and for what? Number four: It's as unnatural as can be! Number five: They won't let husband, wife, relatives or friends anywhere near you when you need them the most, when you're going through the worst of your crisis, and they don't even tell you what's going on! Somebody could die and you wouldn't know until they decide to tell you, and they'd like to send you home and send you a notice through the mail so you wouldn't create a fuss! Number six: They won't allow anybody there to pray with you or encourage you, and they especially don't like people hanging around who have any faith or believe in healing or prayer! Number seven: I frankly believe that for a child of God an American hospital is dangerous! But this isn't true in most of the rest of the countries of the world!--In fact, it's just the opposite. Number one: You do have a choice. It's not against the law in most countries if you want to trust God or if you want to have your baby at home. So there's nothing bad about going to a hospital in other countries where they are not so dictatorial and you do have a choice. Number two: These other simple hospitals, doctors and clinics are much more natural and less anti-God and Satanic--much more natural and closer to God's way of doing things. Number three: It doesn't cost a fortune! It only costs $100 on the average to have a baby in some places whereas in the U.S. it's as high as $1,000! Number four: In the poorer world everything is done more naturally, but the whole medical system in the United States is anti-natural! Naturopathy is now illegal in the States. Pills are a moneymaking proposition!--And of course chiropractors are still looked on as quacks in much of the U.S.! But the poor countries are not in it to make money: They couldn't possibly make money off their poor people even if they tried! And in the U.S. they want all the money in advance for a baby delivery before they will even let you through the hospital door and before the doctor will even give you any prenatal care! In other countries it's free! Number five: In other countries they'll let the whole family in on it! In the poorer countries of the World you can have the whole family there to help with the delivery, and everything is so nice and natural, everybody takes part!--It's a totally different thing! Number six: Here you know everything that's happening: You are there! In the U.S. they keep you in total ignorance and don't let you know a thing about what's going on. So I don't think it's all that dangerous for us to put ourselves in the hands of the doctors in the poorer world's hospitals where they're not in it for the money like they are in the States where they have such total power over you and power over your money.--And operations in the U.S. are so expensive!--If you ever have one and live through it, it will take you the rest of your life to pay for it! But in the poor world they don't cram medicines down your throat and jab you with knives and needles if you don't want them! In some poor countries everything is so natural and normal there's hardly any infant or maternal mortality at all! Trained medical attention and services in other countries of the poor world are there for your help and service. They came to minister, not to be ministered unto! Also, in many other countries of the World the health services are socialised and free to the poor! To sum it up very simply: In America you're at their service.--You serve them!--Whereas in most other countries medical services are at your service and they are there to serve you!